You are here: Home / Life Skills / Are You an Ostrich? Do you bury your head in the sand whenever you need to deal with something uncomfortable or stressful? I confess; I have some ostrich tendencies too. I mean, who wants to deal with unpleasant stuff? Contrary to my late mother-in-law’s opinion, however, unpleasant stuff doesn’t go away if you ignore it. Sometimes it gets bigger and even more unpleasant, but it never, ever goes away. What is it about we ADDers that makes us so ostrich prone? 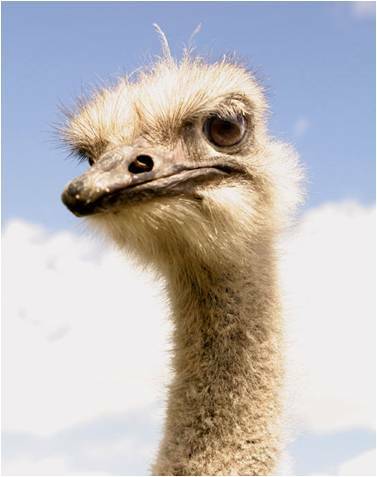 Are people without ADHD ostriches too? I don’t know. I think a large part of the problem is that we forget things, even important things. Things that were no big deal to begin with can become way big deals if you forget them long enough. Ever had something stink up your refrigerator cause you forgot it was in there? Yup. Another thing that turns on our ostrich side is negativity. I hate to say it – I’m trying real hard this year to be positive – but as ADDers we deal with a lot of negative stuff. Hey – what’s more negative than a deficit and a disorder? When you spend a good part of your everyday life putting out one fire after another (or trying not to set another one), it’s easy to see things from a negative viewpoint. So when one more negative thing crops up, it may be very tempting to look the other way. I have to tell you: the best way to deal with yucky stuff is to just do it. Face it head on as soon as possible and get it out of your way. Really. In the long run, you’ll feel so much better, and believe it or not, your attitude will change from a negative one to a more positive one. That’s because you’re putting yourself back in charge and taking control of your life rather than just letting life happen to you. Come on; give it a try. You CAN do it! TOTAL ostrich here!! Then all of the sudden I find that I have to spend a month stomping out fires when it never needed to get that bad. Very frustrating for me.